(Served as BERNEY). Patrick Murray was the son of Francis and Teresa Murray. Patrick was born about 1894 in Garvaghy, Errigal, Ballygawley, County Tyrone. Patrick Murray was living in Tandragee before enlisting. Patrick enlisted in Omagh and served as Patrick BERNEY. Rifleman Murray served with the 1st Battalion of the Royal Irish Rifles in France from 4 June 1915 and was killed enroute to the Battle of Langemarck, Belgium, on 16 August 1917, when ‘D’ Company received a direct hit from an enemy shell killing or wounding 13 soldiers. 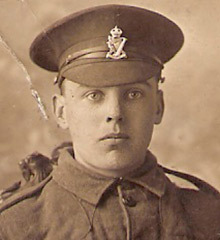 Patrick’s younger brother Francis also died in World War One. Remarkably the two brothers died within 4 days of each other in August 1917.